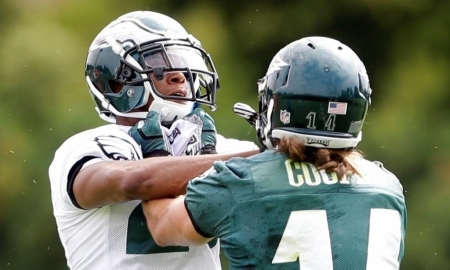 Philadelphia Eagles players Riley Cooper and Cary Williams got into a scuffle at practice of Thursday during one-on-one drills. (video below) It took several players, including Michael Vick, DeSean Jackson and Brandon Boykin, to break up the entangled two. Williams was over heard using a racial epitaph during the scuffle. Cooper, himself, was caught up in controversy earlier this preseason when a video was released that caught him shouting a slur at a security guard at a concert. Williams has had several notable tussles in his career, mostly recently with a Patriots receiver during joint practice early this preseason. Fights in practice are not abnormal but are more common in the beginning of training camp. Police have charged three people in the murder and dismemberment of a Northeast Philadelphia man. Keith Tolbert, Angel Weston and Stephenie Foulke were charged Thursday with the murder of 40-year-old Frank Zarzycki. Zarzycki's torso was found in the Schuylkill River on Tuesday morning by a fisherman. His head, legs, and arms were chopped off and missing. The body was identified by a tattoo on his back. Investigators determined that Zarzycki had visited an apartment on South Street last Monday to use the adult services of Angel Weston and Stephenie Foulke. Keith Tolbert attempted to rob Zarzycki during his date. The three then dragged the body to the bathroom and used a hatchet to dismember body, before putting it in a bag and tossing it in the river. Police are still searching for the other body parts. The three were already arrested by the Vice Unit last Saturday before the body had been discovered as the apartment was a known prostitution site. A woman was struck and killed by an ice cream delivery truck in Allentown on Thursday. The accident happened around 4:00 p.m. near the intersection of Tilghman and 18th streets. The vehicle was a Jack and Jill box truck (not a neighborhood music box truck). Police are on the scene investigating. No word of what caused the accident.